Our aim is to confront the administration with the death and suffering for which they are responsible: more than 10,000 Iraqis and Afghanis, as many as 1,000 Americans killed, thousands more wounded and scarred for life, as well as the economic victims of Bush policies — the unemployed, the uninsured, the undereducated. The Republicans have chosen to hold their convention in New York City to link George Bush and “Ground Zero.” Bush’s policies have created “ground zeros” of death and suffering throughout the world and we hold him accountable for that. Nonviolent direct action seeks to create such a crisis and foster such a tension that a community which has constantly refused to negotiate is forced to confront the issue. It seeks so to dramatize the issue that it can no longer be ignored. The Scenario: We encourage people to dress in white (representing mourning) to gather on Aug. 31, 2004, 3 pm at the site of the World Trade Center (west side of Church St. at Cortlandt St., near the “Cortlandt St.” stop on the R train) for a vigil. At 4 PM we will walk in a solemn procession north toward the Republican National Convention at Madison Square Garden. Those who cannot walk the entire distance are asked to join us at 5:30 pm at Union Square (NW corner, 17th St. & Broadway) for the last leg of the procession. By 7 PM we will reach Madison Square Garden and, when stopped, we will “die-in” as a way to graphically represent all those who have been killed by the government’s wars in Afghanistan and Iraq. Though this nonviolent die-in may result in our arrest and may block or inconvenience Republican delegates and others, we think this is a small price to pay to dramatize and call attention to the enormous horrors inflicted on the world by the U.S. government. The Bush administration must be held accountable. 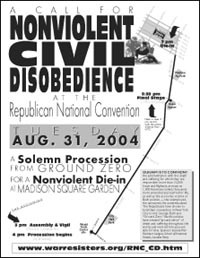 Map of Route: Click on the image to see a detailed map of the route of the solemn procession to the nonviolent civil disobedience die-in at Madison Square Garden. Map of Madison Square Garden Vicinity: To see the streets surrounding Madison Square Garden and expected police barricades, click here. Our attitude will be one of openness and respect toward people we encounter. We will not use physical violence or verbal abuse toward any person. We will not damage any property. We will not bring or use any alcohol or drugs other than for medical purposes. We will not carry weapons. Press Release. To view a copy of our August 30 press release, click here. Call to Action Flyer for CD. Click on the image at the right to download an Acrobat PDF flyer encouraging people to join our procession and die-in on August 31. Tuesday, Aug. 31, 10 am to noon (a quick session for those more familiar with civil disobedience). Street Flyer for Aug. 31: This is the flyer we will be handing out on Tuesday, August 31. This will help explain our action to observers as we march to the Republican National Convention. If you would like to download an Acrobat PDF of this half-sheet flyer (2-up on a page), click on the image to the right. In addition, we will have an information table at the Festival of Nonviolence (sponsored by the Green Party) in Washington Square Park, Aug. 28, noon to 6 pm. August 31 Actions: This NYC WRL-sponsored action is part of a day of civil disobedience called by the A31 Action Coalition. There will be many other affinity groups from across the country — some independent, some affiliated with other organizations — participating at the same times, for a mass convergence on Madison Square Garden that evening. We are active participants in the spokescouncil meetings described on the A31 website. 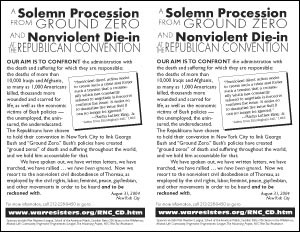 Among the other organizations organizing actions around the Republican Convention are United for Peace and Justice, CounterConvention, and RNC Not Welcome. 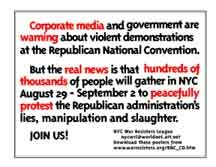 Mini-Poster: In an effort to counter establishment propaganda about the possibility of “violent demonstrations” during the RNC, this 8.5" x 11" flyer designed to posted around Manhattan. To download an Acrobat PDF of it, click on the image (right). You can also download a 4-up sticker-sized version (below). Please distribute as widely as possible. Media Coverage: We've begun to get some media coverage of the Aug. 31 civil disobedience. 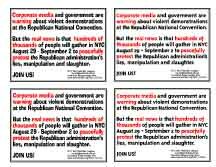 The following are PDFs of articles that have appeared in the Newark Star-Ledger (Aug. 24), New York Times (Aug. 5), New York Daily News (Aug. 5), Village Voice Online (Aug. 4), and IndyMedia photos (Aug. 4) as a result of the A31 Coalition press conference on Aug. 4; also, an Associated Press story (Aug. 3) was carried in about 20 media outlets (e.g., Newsday, Miami Herald, San Francisco Examiner). Participating Organizations: This component of the day of civil disobedience is being organized or endorsed by War Resisters League, Socialist Party of NYC, School of the Americas Watch, Voices in the Wilderness, Atlantic Life Community, Progressive Programmers League, The Mourning Project, Pax Christi, NYC War Tax Resistance, Veterans for Peace, among others. Believing war to be a crime against humanity, the War Resisters League, founded in 1923, advocates Gandhian nonviolence as the method for creating a democratic society free of war, racism, sexism, and human exploitation. Next Meeting: Thursday, September 9, 7 pm, 339 Lafayette St. (Bleecker St.) in Manhattan. For more information or how to participate in this action, please e-mail nycwrl [at] att.net or call 718-768-7306. If you haven’t contacted us before, please give us your name, e-mail address, telephone number, where you’re from, and what previous experience (if any) you have had with nonviolent direct action.